They didn’t quite use the words Disce aut Discede, but Sri Lankan cricket bigwigs have given an ultimatum to the members of the national cricket team that sloppy fielding will no longer be tolerated. The hard hitting message was conveyed at the tail-end of the disastrous bilateral series against Bangladesh. The national cricket team was unofficially ranked as the worst fielding unit in the world after poor catching cost them dearly in the second Test against the tourists at P. Sara Oval. Although initially the authorities distanced themselves from the tag as world’s worst fielding side, they couldn’t run away from reality. The first ODI at Dambulla was a case in point where Sri Lanka were beaten by 90 runs. The current Sri Lankan team has at least six sloppy fielders in their rank and not a single player, who could be ranked world class, a far cry from the glory days when Sri Lanka were one of the best fielding units in the world alongside South Africa. There was a passionate effort to put fielding right after the humiliating defeat at Dambulla, but what Sri Lanka lack is consistency to search for excellence in this vital discipline. When Sri Lanka set Bangladesh a target of 281 to win the third ODI and the series at SSC, someone said that the target was actually 241. The joke being that when a team plays against Sri Lanka they start their innings with 40 runs assured as that’s the approximate amount the Sri Lankans give away due to their sloppy fielding. "We have already put some plans for the players when it comes to fielding. Although the Provincial Tournament (one-dayers) is starting on the 9th of April, we want certain things to happen with regards to fitness and fielding," the national cricket team’s Cricket Manager Asanka Gurusinha told journalists after Sri Lanka were thrashed by 45 runs in the second T-20 International at RPS Thursday night. "The Chairman of Selectors, the Trainer and myself we are looking at certain things. There was a clear message from Chairman of Selectors and myself. We are not going to select players simply because they have scored heavily in domestic cricket. They need to achieve certain standards in fielding. When the Provincial Tournament finishes, we will start training from 2nd of May. We have to select the Champions Trophy side by 25th of April. So from 2nd of May we have time till 17th of May before we go and we will have training sessions which are specific with fielding," Gurusinha added. There were also questions asked as to why SLC’s fielding expert, former South Africa international Nic Pothas wasn’t used to fine tune the team’s fielding skills during the last four weeks. "We have discussed that. Next week or so we will finalize our support staff to England and beyond. I have heard about Nic Pothas and we want the best support staff to go to England with us and beyond," Gurusinha said. 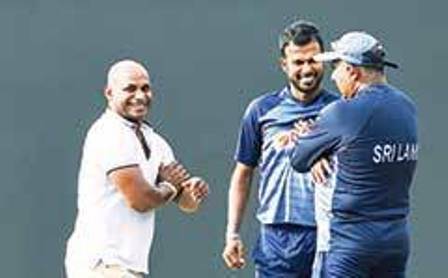 In the last five years, Jayasuriya has been the Chairman of Selectors for four years and you often wonder, what it took him so long to put his foot down and demand more commitment to fielding. Better late than never. Gurusinha and Jayasuriya have talked the talk and now it’s time for them to walk the walk.